Purchased a 4 TB Western Digital My Cloud and configured through my router fine. But due to the slow transfer rate I decided to use the ethernet cable and go direct to my laptop. The Ethernet controller is Qualcomm Atheros AR8161 PCI-E Gigabit Ethernet Controller (NDIS 6.30) on a Windows 10 Toshiba Laptop. I have the latest driver. So of course I gt the message "Ethernet doesn't have a valid ip configuration". P.S. this is the first time I have used the ethernet connection on this laptop. I saw a youtube video showing how to manually configure but I am a bit hesitant and thought I might check this great forum. If you are plugging the nas directly into your laptop you would need to set it to have a static to be able to connect to it, it probably is set for dhcp. You should plug both the computer and the nas into the router that should give it an ip address then youshould be able to connect. @Scott CNSSPD is correct while reading some reviews of the drive they complained about the same thing, of it being slow. As CNSSPD has stated giving it a static IP will fix your issues. I have done the above. 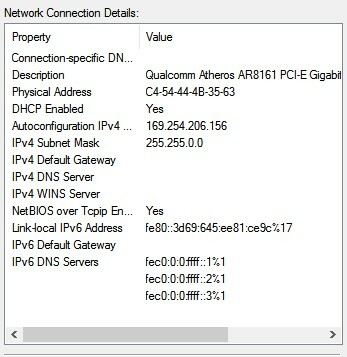 How do I check to see if a static IP has occured? Have set My Cloud to static IP of 192.168.2. But I am not getting any indication of connectivity nor do I see it as a network drive when it is hooked up directly via ethernet to my laptop. However, if I connect from My Cloud to router and then router to laptop with ethernet I am getting actvity, albeit still slow. What speed are you getting transferring files through the router to the nas? Are the lan port on the router gigabit? I have just recently returned the server and am going to work a different storage solution. Thank you all. It was just getting too involved. Not nearly as intuitive as it would seem so returned it.